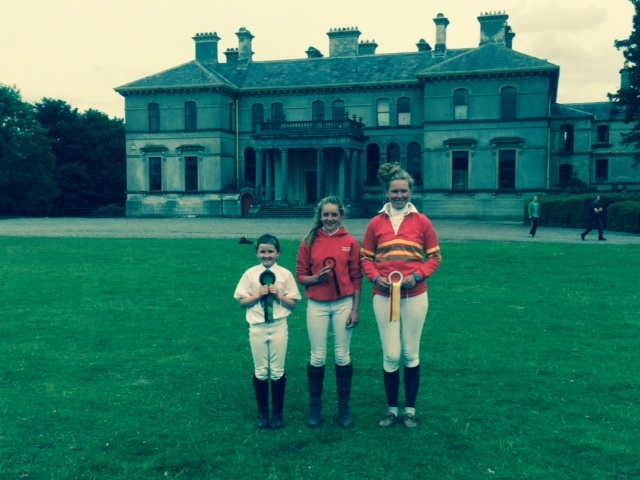 Thank you to all members, parents and friends of Carlow Hunt Pony Club for making the ODE in Bunclody such a success. It was a tremendous effort by all involved & would not have been a successful day without everyone's help. Well done to all participants. The results are available here. Niamh Byrne, Eimear Jackman, Andrea Cooper, Ailish Osborne, Jane Hosey, Taylor Deane (2 Horses), Declan Deegan, Nira O’ Gorman, Romy Bolger, Niamh Roche, Jerry Skelton, Ciara Hennessey, Andrea Doyle,Carla Hennessey, Paul Roche, Roisin Dowling & Izzy Walsh. Alannah Walsh (2 Horses), Madeline Byrne, Mary Kate Burke, Aoife Murphy, Meadhbh Browne, Jack Carr, David Browne, Megan Telford – Kelly (2 Horses), Catherine Kavanagh, Lucy Bolger, James Kavanagh, Megan Flood, Lorna Byrne & Ella Murphy. Julie Hatton, Mary Hickey, Cara Kelly, Claire M Kavanagh, Holly Malone, Lisa Carroll, Rachel Carr, Áine Kavanagh, Sophie Walsh, Zeta Ashmore & James Browne. What a great day we had on Sunday at the ODE! The weather was perfect, not too hot and the course rode really well. There was really positive feedback from all the clubs that participated, so thanks to everyone who helped and competed for making the annual event a great success. Thanks to Michael Kelly for sharing the Photobucket album below. Kay Deegan, Bairbre Wall, Liz Malone and Ivan Hatton are the co-ordinators for 2015. The One Day Event Qualifier will take place on Sunday 21st of June. Entries will be taken via the on line entry system only. Entries must be in at least a week before each event and MUST be prepaid. The Pony’s name you use to enter must be the same as his passport (not his stable name). Dressage times will be posted on the website a couple of days before the event. All events have strict tack inspection for all three phases so it is very important you are familiar with the current Tack Sheets for Dressage, Show Jumping and Cross Country (See Downloads page for Tack Sheets). There will be a strict tack inspection at every event. Make sure you know what is on the Tack Sheets so you are not upset on the day. You should allow time for inspection as there are three different tack inspections at a one day event, one for each phase, dressage, show jumping and cross country. There is quite a difference in the tack sheets for dressage and cross country, so do study them.Tack Inspectors are not allowed to make exceptions so please make their difficult job as easy as possible by presenting correctly. Remember rules regarding tack etc. are for the safety or horse and rider which is of paramount importance in the Irish Pony Club. To be eligible to take part in the Red Mills one day event qualifiers you must have passed your C Test. To qualify for the Horse Trials Championships which take place in August, you must take part in and complete (all three phases) at a minimum of two qualifiers. One with a clear round and one with a minimum of 20 penalties (one stop) cross country. This criteria is for Juniors, Intermediates, Members and Associates. The General Information above applies to these events also. The Under 12 and Novice competitions are not qualifiers for any championships. It is recommended that competitors in Under 12 competitions should have their D+ test. This page is a brief guide to Eventing as an activity in the Irish Pony Club. Please refer to the current IPC Eventing Rule Book for further information, or have a chat with your D.C. as you will need their permission to take part. Please also consult the current Irish Pony Club Guide to Competitions. Eventing consists of three parts: a dressage test, a round of show-jumping and test around a cross-country course which take place on the same day. The Eventing Championships is the only competition that takes place over two days and is usually a two-day-event. The scores from all three phases are added together. The winner is the one with the lowest penalty score. The lowest score is best, faults in cross country and show jumping are added to your dressage score. If you have 0 faults in these sections, you finish on your dressage score. There are very strict rules about tack and dress. You should consult the current Tack Sheets, for each discipline, as there are three tack inspections at competitions. To be eligible to compete in Open, Intermediate and Junior classes, you must have passed your C test. In the Under 12 class, riders must have passed the D+ test. All riders must be active members of their Branch and be paid up members of the Irish Pony Club. They must have participated at three appropriate rallies since 1st June of the previous year, two of which should be cross country and on the horse on which they now wish to event. District Commissioners have discretion in this regard, and have to sign off on the form that this particular child is able to go cross country. Ponies and horses must be 5 years old or over for all competitions, there is no height limit for horses but a horse/pony is only allowed to go under one rider at one event. It must not go eventing again the next day! U12 - children who are under 12 years of age on 1st January of current calendar year; must have D+ Test to participate. U12's don't qualify for the IPC EVENTING championships, which are held in a different location each year in August. The maximum height of jumps is 80cm for show jumping and cross-country. Some Under 12 competitions include a Starter Stakes class. Junior - members who are under 15 years of age on 1st January of current calendar year; competitors must have C Test! Teams of 3 or 4 can participate in the IPC EVENTING championships. The maximum height of jumps is 90cm for show jumping and 90cm for cross-country. Any rider negotiating a 90 cm cross country track, whether it is a qualifier or a novice competition, must have their C test. Intermediate - members must be under 23 years of age on 1st January of current calendar year; competitors must have C Test. You may do Intermediate Eventing even if you have your B test. The maximum height of jumps is 1m for show jumping and cross-country. Open - must be under 23 years of age on 1st January; competitors must have C Test! The maximum height of jumps is 1.10m for show jumping and for cross-country. General: The dressage test must be ridden from memory. There is no time limit, and the movements of the test must follow in the order laid down. The arena for these tests is 20 metres by 40m, (the size of the arena will be specified on the test - higher tests are often ridden in a 20m by 60m arena) and the boundary will be marked. If the pony goes outside of the boundary during the test, marks will be deducted, or elimination may follow. If you get mixed up, or make a mistake while riding the test, marks are deducted. You may carry a whip, but use of your voice for encouragement or anything else is prohibited! When your test is finished, the judge will mark the sheet and this is sent to the scorers who will then add your cross country and showjumping scores to it to get a result. There are different dressage tests for the different age groups but the same test is used during the same calendar year. See Dressage Tests for current tests being used. The dressage test is always the first of the three parts in an event. Note: You will be given a dressage time a few days before the Event which must be adhered to! The dressage times are usually available on this website two/three days before the event. There are usually many competitors and so if you are late for your dressage time, you may not be allowed to ride your dressage test! This might seem a bit complicated but the people doing the scoring on the day, know what to do. Just remember, the lower your dressage score in Eventing, the better! You can collect your dressage scoring sheet at the end of the competition and this is highly recommended because the judge's comments tell you what you are good at and what you might want to improve on. General: A regular round of show jumps is jumped in an arena in a field (or sometimes in an all weather arena). Jumped under SJAI rules, with a few modifications. There is only one round, no jump-off. The course consists of seven to ten numbered showjumps, at least three of which will be spreads and will include a double combination. Practice fences will be provided and unsafe or overheight jumps are not allowed. There is a time allowed and a time limit in operation at some Horse Trials. The showjumping course should also be carefully walked on foot, and a note taken of where the start and finish are. The difficulty of the jumps varies for the different age groups.. For heights see the Irish Pony Club Guide to Competition Ages. The IPC Eventing Rule Book will specify the size of the jumps in detail and will tell you which kinds of jumps are allowed for which age group. Scoring: There are lots of different things that can incur penalties or even elimination as you will probably know from having done show jumping before. However, don't assume that IPC show jumping always follows the SJAI rules - it doesn't necessarily! Again please check the IPC Eventing Rule Book for details. The total faults are added to the dressage score. General: This is most people's favourite part of the day! The fences are solid, fixed and imposing, and can include water, banks, drains, skinny fences, and almost anything else. Obstacles are numbered and flagged, with the RED flag on the RIGHT, and the WHITE flag on the LEFT, always. You must walk the course at least once before riding over it, preferably with a knowledgeable adult, and as few chattering companions as possible, as you need to concentrate and pay careful attention to your own jumps! These are always colour coded, and you will have to find out at the start which is the colour for your competition. You can often see a course plan at the Secretary's tent. There is always a time allowed for the cross country, and if you are very slow or have a problem with a jump, you will also probably have time faults. Heights for the cross country are in the IPC Eventing Rule book available on this website. If you fall off your horse anywhere on the cross country course, you are eliminated and must leave the course. This applies to all falls, even when you land on your feet! However, there is always another day! You will be eliminated also for outside assistance from parents or anyone on the ground, and in championships, this includes verbal instructions. Four refusals anywhere on the course. There are a few more, but these mostly cover all the faults which will lead to elimination. Entries for ALL Events must be booked through your own branch. Each branch has their own system for this. Don't contact the organiser yourself because your DC must send in your entry on a special signed entry form. You must give the name of the rider, the passport name of the pony and the competition you want to enter. Each member pays their branch and one branch cheques is sent with the entries. When and where are they on? Irish Pony Club Event competitions usually start in June. They are held at various venues throughout the country and are hosted by different branches. A list of dates and venues is available soon after Easter. These will be available on this website. This list will include qualifiers for the championships together with a list of Novice Events. There are also Novice Events held which are not qualifiers and are also for U12's. These events are less demanding than the qualifiers and generally take place after the Championships. Combinations who qualify for the championships are not allowed to take part in the Novice Events. Also ponies and riders who took part in the Championships may not swap animals for the novice events. As with all matters in Pony Club Eventing, you should talk to your D.C. if you are interested in taking part in these. There are strict qualifying rules for the Eventing Championships. Briefly they are listed below but at all times you should refer to the IPC Eventing Rule Book. Intermediate: Must have competed in 2 IPC one day events one of which must have been completed without cross country jumping penalties, and one not more than 20 jumping penalties (one stop). Note: Not all rules could be dealt with here since this is just a short reference page. If you decide you are interested in Eventing please make sure you are familiar with the current IPC Eventing Rule Book and discuss it with you D.C.